These beautiful lizards grow up to 120 cm long. When they are young, their colouring is quite dark, but they become more yellow as they get older. Quince monitors are excellent swimmers and like most other monitors they are very good climbers. They eat a wide range of small animals, including insects and frogs, and eggs. They were only discovered in 1997, so scientists still have a lot to learn about them. 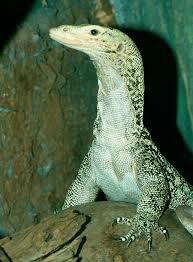 Quince monitors are only found in the Sula Islands of Indonesia. They are threatened by poaching for the pet trade as they are very popular pets. Are there any other interesting facts that you would like to share about quince monitors?